It has been nearly nearly 5 months since I rode into Eureka, Montana ending the 2000 mile Canadian ride last year. We were welcomed into town by a warm, sunny, mountain-fall afternoon. Nice way to end a ride. I came in from the Canadian ride wanting to see more of Canada, spectacular country, roads very clean, plenty of open easy to maneuver country embellished with friendly, delightful Canadians. I came home with many Canadian friends. 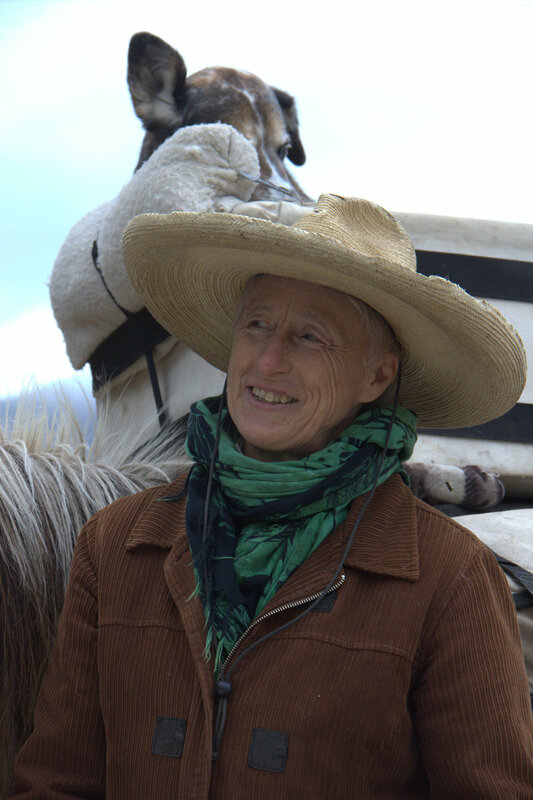 NOW, however… it is time to think about stepping back into the saddle and heading out on a new adventure. A 1000 mile – fast ride thru-out Idaho, Wyoming and Montana, a big loop, beginning and ending here. That is the first thing in mind. 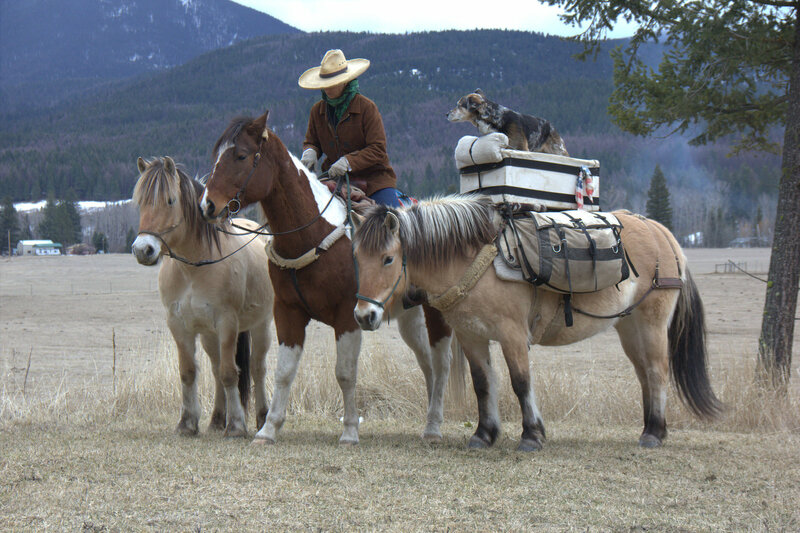 I will be traveling with a young Canadian gal named Kelly Cott and her little Halflinger mare, whose name I do not recall right now. HART will be staying home, retiring from long riding at least from anything of great length. 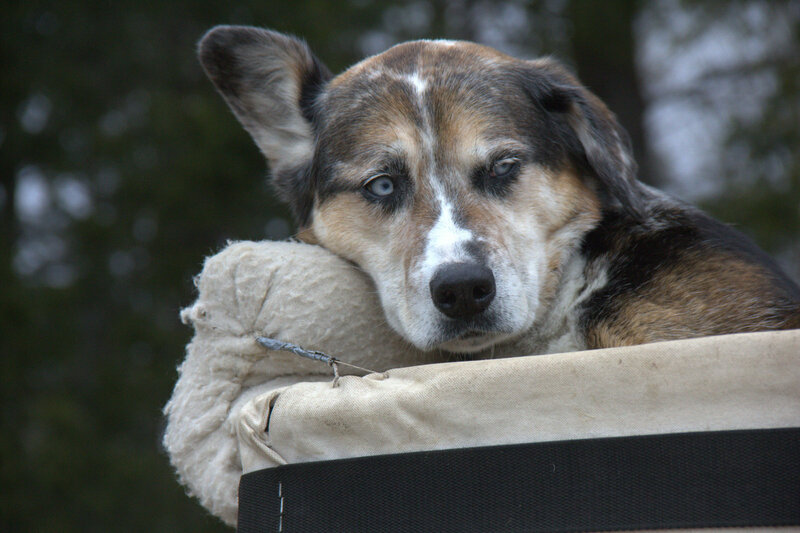 Hart’s steadfast nature and long walking stride will be missed. 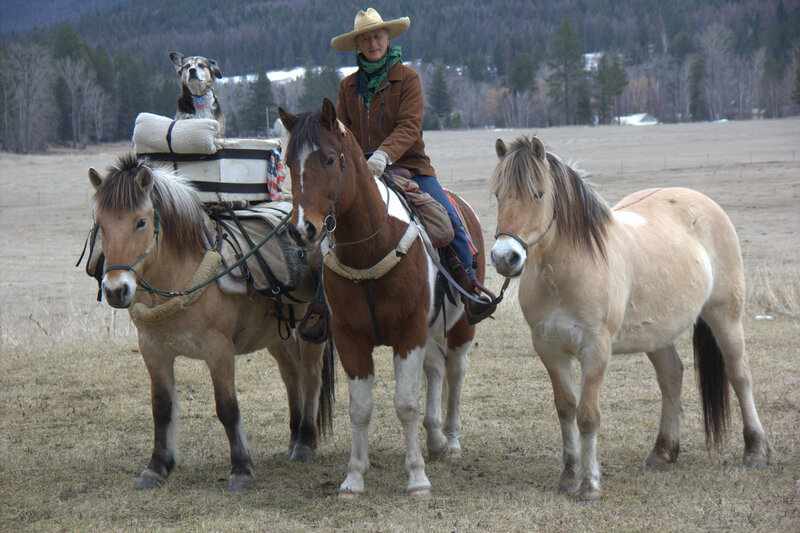 He’s in good health, has good muscle and beautiful colorful winter coat, (I credit SOURCE, Micro-nutrients for much of his good health) but the length of the rides are just to much for him so he will stay here in Eureka, Montana with Nancy Newman, a skilled horsewoman herself. She has a beautiful ancient barn, huge pasture land and loving care to offer Hart, besides horse friends. My big Hart, he’s got the biggest heart I know. He’ll be well cared for by Nancy..
CLAIRE is also staying home for this ride. She will be staying at the Theodora Brennan’s home where I am now camped preparing for this years ride. (Essie got her start here and it was Theodora who helped coax Essie Pearl into this world.) Clarie is quite at home here and if she misses me when I leave it won’t be for long. ESSIE PEARL is moving into lead horse position for this ride and Montana Spirit will be doing most of the packing. We are traveling light all the way around. 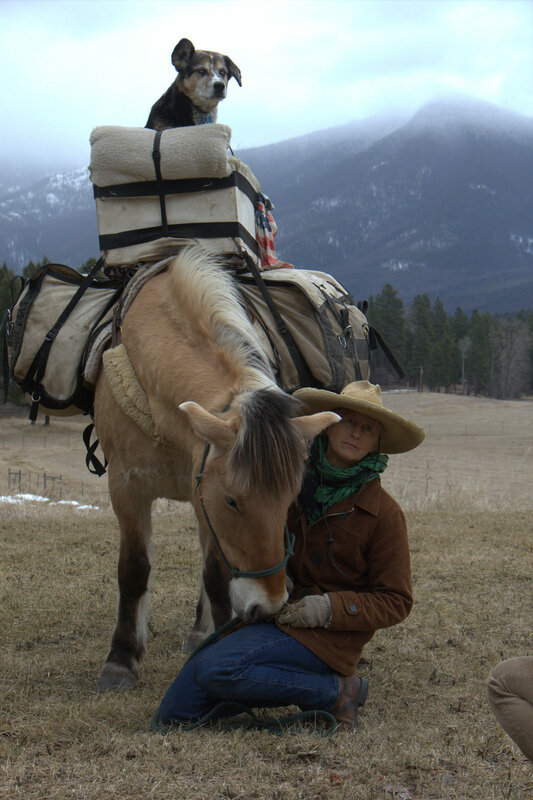 Kelly and I will walk half our miles each day then step into the saddle and pick it up, traveling faster can only be done if one is willing to travel light and get off and walk. I want to cover a lot of land but do it lighter this year, unlike what I have been doing with Claire and 3 horses, big difference. I met Kelly on my ride crossing the Yak Mountains last year. She and her husband Ben own a garlic farm north of Moyie Springs, Idaho. They came out and stopped me as I rode past on the road. Friendship was inevitable. I was so impressed with this couple and all that they had done with their garlic farm. So…when I heard Kelly say,”I have always wanted to do…” well you know the rest of the story. I have heard it hundreds of times. Thousands of spirits ride vicariously in the saddle with me, many say they want to do a long ride but only a few will ever do one. But here was a woman that had horse experience, she is fit, is Canadian(Quebec) has her husbands blessing, and comes encased in a spirit of adventure…You see in the back of my mind I am thinking, Ummmmm, ahead for next years Canadian ride, coast to coast, a rather ambitious ride even I will admit… But I would like do at least part of it with a Canadian rider…so Kelly and I talked, and talked some more and well… here we are preparing her little fat Halflinger mare… and Kelly for a 1000 mile training ride, we shall see how they like this long riding business. I so enjoyed having Emily McKee ride with me last year. Although she had planned on riding much more than 250 miles she gave it her best before admitting that it was just to damn much for her. But we did have a good time of it. 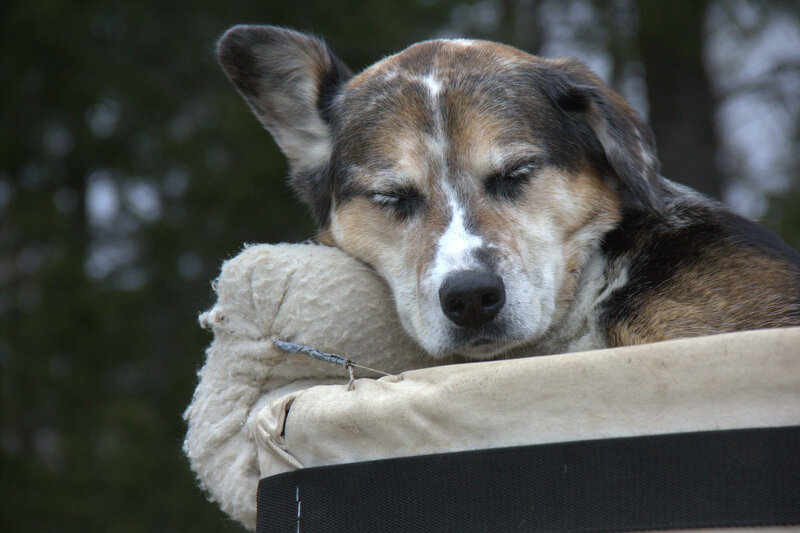 I talked and talked into the night until I would hear snoring shortly after her head hit the rolled up towel she used for a pillow. 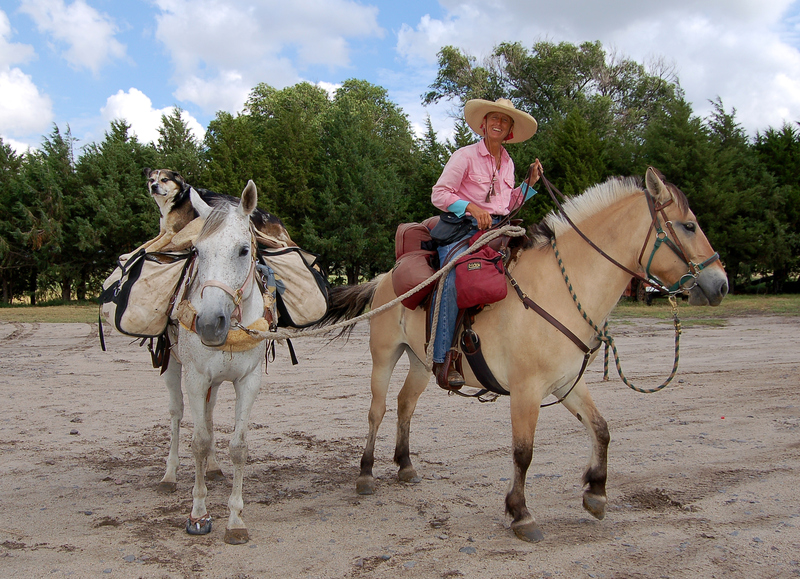 She helped with the daily chores each day and helped with connections…connections when we rode into town, finding places to camp, directions. 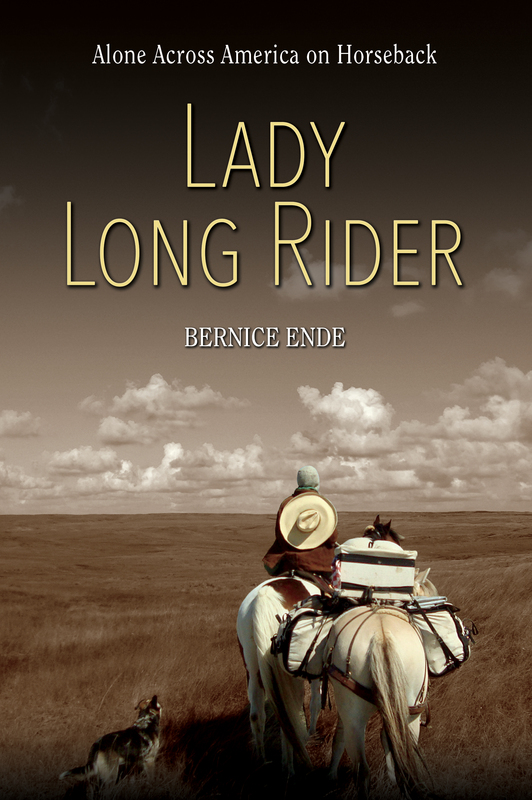 Long riding is not easy, what Emily found so difficult was the uncertainty of the daily life, never knowing what is around the corner, always having a edginess to life that does not normally exist . Well all I can say is that there’ll be one heck of a pack of females out riding this year so look out. I should be out by the first of May. Winding my way back over to Moyie Springs, Idaho the same route I came in on last year. A two week ride, giving my Essie Pearl and Montana Spirit time to remember the routine and bring an assemblage of unity into my tribe before picking up Kelly and her pretty mare. Kelly will have all of her horse’s traveling papers in order and have horseshoes set on as I have asked. 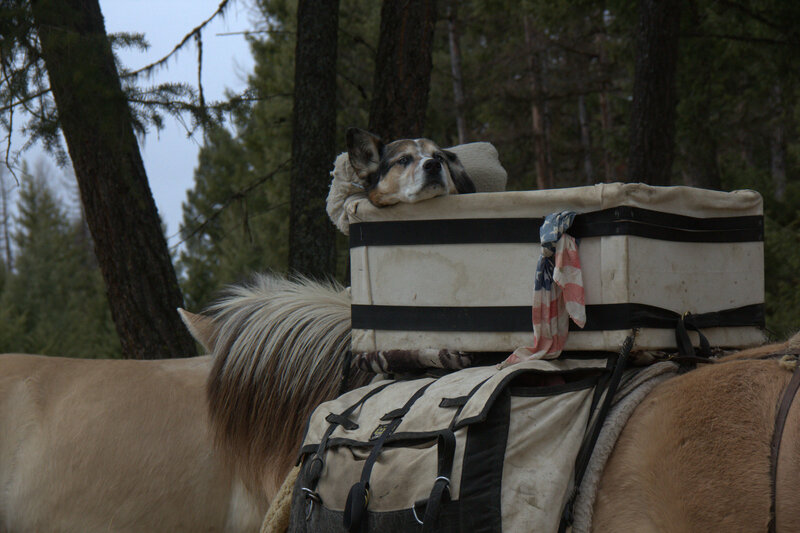 I’ll spend a day fitting her horse out with saddle, pads and equipment before we head south into south central Idaho. 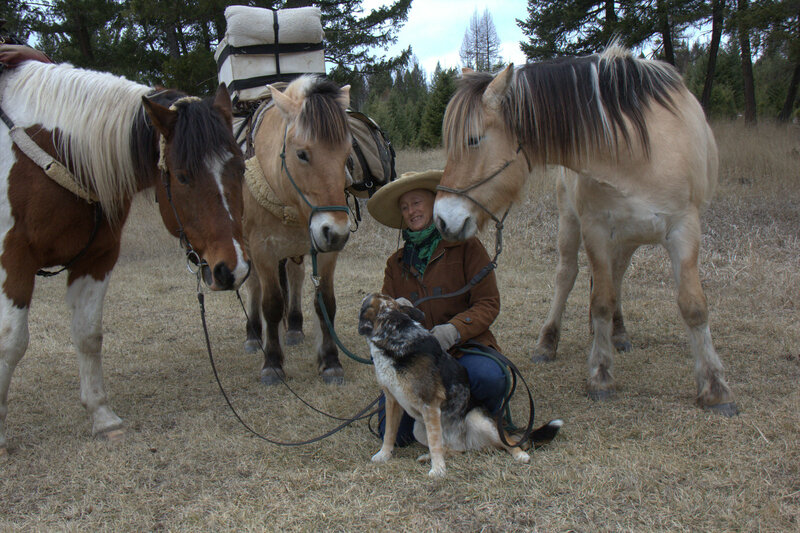 When Kelly and I return from this ride, she will head back home and I will spend one month here in the Trego area before riding back over to Forsyth, Montana where I hope to spend one more winter camped north of town on 91 year old Bill Straws land preparing for next years Canadian ride. We, the horses, Claire and I have had spent an easy, mild winter over here in my home town, in these majestic Rocky Mountains. I accomplished a great deal on my book, produced a DVD, brought my precarious computer skills up a bit. Gave many talks, wrote 5 stories for FIDO MAGAZINE, gave several interviews , rested and ate way to much good food. Essie may turn her head around when I step into the saddle and say, “hey maybe you should start walking NOW”. Ending this posting with a thank you of course, letting all of you who have sent cards or emails this past winter, filled with kind words, encouragement or support in one way or another…..THANK YOU, a sincere and hearty THANK YOU. Previous Post Previous Post: March 8th, 2013 endehomebase@yahoo has been hacked…..
Next Post Next Post: March 20th, 2013 JUST A REMINDER…….